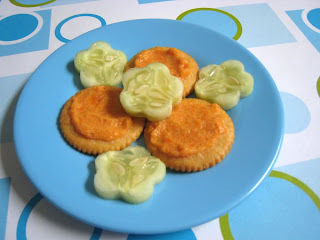 This is a sponsored post from Chef Boyardee and BlogHer. I often get comments on this blog regarding F&B and the choices they make regarding food. Thankfully, it’s usually good ones, either complimenting them when they are making the choices or asking how exactly we got them to that point. To our happiness, they’ve both loved food from the beginning. I made all sorts of baby foods for them, we’d go to Whole Foods, buy a variety of interesting looking veggies, cook till soft, then puree them to the right texture. Faith’s long time favorite was lentil stew—my own combination of lentils, squash, zucchini, carrots, beans, pretty much whatever veggies I had on hand. Ben has always been my fruit fiend. Other than banana, his first foods were fresh pineapples, mangos and melons on our Hawaii trip when he was six months old. But since then, I’ve come up with a few favorite ideas to get the kids to open up to more new foods. Bentos, of course! Those are *always* my number one idea for feeding your kids. Cute food is always much better than not cute food. Remember those studies earlier in the year, how carrots with, say, Princesses on the packet were apparently yummier than the identical carrots with the plain packet? It’s the same theory—smiling sandwiches, cute fruits and shaped veggie? All tastier than a plain sandwich, carrots and an apple. My own not-so-scientific research with F&B has proved that one time & time again. Dipping sauces help a ton. Both of mine love yogurt dip for fruit, hummus for veggies and bread, ranch for almost anything. Cream cheese can make wonderful dips or spreads too, combined with avocado or a bit of tomato sauce and roasted red peppers are especially good. Carrot-ginger dip is pretty yummy too. Cook with your kids! The sense of accomplishment often means they’ll try what they cook. My two have been in the kitchen with me since they were toddlers. A butter knife and soft foods is a great starting point for a little sous-chef, same with measuring cups and spoons, pouring, stirring, etc. (As a bonus, lots of great counting and math skills happen in the kitchen.) At 8, Faith can follow almost any recipe and loves to bake. She recently made muffins all by herself, other than lifting the tray up into our double oven! Bake with fruits and veggies. Personally, I am not a fan of hiding fruits and veggies in so-called kid foods and pretending they aren’t there. To me, it teaches more of “good foods tastes icky, we’ll hide them in more tasty/less healthy items.” You aren’t going to find brownies with spinach puree or macaroni and cheese with hidden squash around here. You will, however, find fun things like chocolate-zucchini muffins with Ben grating the zucchini first or sweet potato cupcakes made by Faith. We try label everything as what it is. In the process, we’ve discovered that zucchini does not really have much of a flavor on its own, so our zucchini muffins are usually very moist and taste like whatever else is in them. Sweet potato leaves a very similar flavor to pumpkin. And we all love anything with fruit, even making our own dried fruits for granola bars and our own pure fruit roll-ups and popsicles. Let them help choose foods. It might be a little more expensive at times, but I’ll let both kids pick produce they want to try or a new kind of cheese or a fresh loaf of bread. They also help with meal planning. I give them guidelines and they’ll pick what they might like to have. Pizza doesn’t count as a choice either, that’s a Mom-break night! Faith’s favorite choice is her favorite pork chop dish with rice and maple glazed carrots. Ben is on a steak-kick lately, along with potatoes and peas most likely. They both love Italian food, so pasta is another go-to meal. For great tips from moms just like us, sharing experiences, ideas and advice on how to get kids to eat better, visit Club Mum. Club Mum is the perfect resource for moms to learn helpful hints on a variety of topics, which can be applied to their own family. Club Mum is also on Facebook with daily tips, recipes, articles, questions and a terrific and active community! BlogHer is giving away a $200 Visa gift card in conjunction with this post! To enter, leave me a comment telling me your favorite parenting tip or trick. It can be food related, but it doesn’t have to be! What’s your favorite brilliant idea that makes your life run that much smoother? Not sure I'd call it brilliant... but something that makes my life go so much smoother when the world is set on pinning me against a wall is to prepare a day (yes, a day) in advance. Just a 'day'. I always have a pair of clothes I can use to the office in case I wake up too late and don't have time to pick something up, shoes and socks included! I also keep $10 hidden away in those clothes, just in case. I have a bag of instant food that can cover me for breakfast and lunch (say, a packet of instant oatmeal with a packet of dried fruit and some raisins and a can of soup with individually packaged oyster crackers). I almost always have some sort of fruit around, so grabbing one isn't difficult. I also carry a change of clothes in my car (and have had to use them twice). One hour commute each way five days a week for the past 6 years, and having some extra clothes can save a day BIG time. The one thing that helps me is I have to have my kitchen cleaned up each night before bed. I feel a sense of accomplishment at night when I get my kitchen picked up before bed. If dirty dishes are left in the sink, it depresses me when I see them in the morning. I breathe a sigh of relief when I get into the kitchen knowing that I don't have to clean up before breakfast. I could never get my child to brush her teeth good...she's 2! She would almost bite my finger off and wouldn't let me get to the back teeth, so I started telling her there were animals in her mouth and we had to get them out. Her favorite is the pig. I will make pig noises while brushing her teeth and tell that pig to get out of her mouth. She loves it, and leaves her mouth wide open for me now. I also wrote a blog about the contest! Stacy, I use the same trick with my 18 month old son! It works wonders. The thing that gets me through the day is to have my toddler help with just about everything. I used to think that things would go so much faster if I did it myself, but I'd have to keep stopping to redirect my son or stay up late to get things done after he was in bed. Now, I just involve him in the process. He loves to help with laundry by putting clothes in the basket, putting stuff in washer and dryer, handing me clean clothes to fold, and even putting his socks away in the drawer. When I empty the dishwasher he hands me silverware and puts away lids. He loves to swiffer the floors and is learning to help with the baking. It's so much easier to teach a child to help at a very young age when they are so eager to be involved. Besides keeping him entertained in the present, I'm hoping this is the start of great lifelong habits for my son. My daughter is a master procrastinator especially at bedtime. Before her bath she picks out three books for her bedtime stories. Any time she dawdles, refuses teeth brushing, runs away, etc. she gets a warning then I calmly walk into her room and put a book back on her shelf. Then we resume what we were doing. She's never had less than one book and now she gets all three on most nights. I hope you don't mind if I post twice in a row. This morning I came up with an idea for my son. Since dealing with his food allergies creates significant challenges with normal activities, I'm always having to come up with creative alternatives. Every Christmas, my family makes our special holiday cookies, sugar cookies with frosting and sprinkles. I was sad thinking about how my son couldn't participate in something that is so engrained in our family tradition. Since I haven't figured out how to make the cookies allergy-friendly for him, I decided he and I could make paper cookies this year. I traced the cookie cutters on to paper (felt, cardboard or foam matte would also work well), then we slathered on glue to serve as "frosting". He had a blast spreading the sprinkles all over his "cookies". Now, we just have to find a special place in the house to display them. I have two children- 2 1/2 and 9 months. When we head out of the house, I get the 9 month-old ready last. Otherwise she just takes off everything (hat, shoes, mittens) while I am getting myself or the toddler ready. It cuts a good 10 minutes off our time needed to get ready! To get my toddler son to agree to wash his hair I put a damp washcloth over his face so it wouldn't get splashed, which he disliked. Thanks for the giveaway! To make life easier on me, I keep my 3 yr old's clothes/shoes/underwear/socks in my room. Her clothes hang on the bottom bar in my closet and she has two small drawers in a nightstand for her underclothes. Her shoes have a shoe rack in my closet as well. Her bedroom is upstairs so it is much more convenient to have her things downstairs. I have become a "cook ahead" person. I really like to have a ready bath of spaghetti sauce in the freezer ( I make my own) and other things like this that are easy to grab and do real quick. I used to be such a last minute cook, and that led to many eating out trips. We do not do this anymore. It really helps me to plan a few things ahead! Right now the best way for me to have a little extra peace during the hectic routine of getting 4 elementary kids off to school while tending to a toddler and preschooler is taking a few minutes each night to lay out all the clothes, socks, hairbows, etc. i cant imagine the choas that would ensue if i didnt do just that one thing each night. I always prep the night before for the next day. I either have to leave the house in the morning leaving my hubby to get all 3 kids (5, 3 and 5 months) ready alone or I'm home and trying to do the same. That takes all our time in the AM just getting them dressed and fed. So every night I make my oldest daughter's (and my own on work days) snack and lunch. I also set out all the clothes for everyone to wear the next day. It saves us a lot of time in the morning! One of the things that I did that makes my life a bit easier and prevents tantrums with the kids is schedule out the day. It helped me because I could actually see hour by hour throughout the day how much time we had to do certain things. It also helped me figure out how to work schedules around 1, 2, and 4 year olds whose schedules can be extremely different. It also gives the kids a sense of when something is going to happen so when I tell my 4 year old computer time is over she knows it's coming because it happens everyday the same and prevents tantrums. I don't always keep everything strictly by the schedule that'd be pretty difficult with little ones, but it is a great guideline. One thing that has worked well for me is making cleaning fun. We have a rule in the house that you can't play video games unless your room is clean. So usually at least once a day, rooms are clean. We occasionally stop what we are doing, everyone picks up 20 items and puts them away. With 4 of us doing that, it is 80 items put away. Sometimes we race clean. Kids clean their room and mom picks another room to clean. We race to see who can pick up their room the fastest (putting things where they belong). Sometimes winner gets treat (can be anything from a piece of candy or handful of cereal). Sometimes all they get is a "good job" from Mom. Other cleaning games we have plays is "I spy" or "Hot or Cold". I've even let them be the parent and tell me (nicely) how many things I should pick up. Oh and the two older kids are 4 and 6. The almost 2 year old also gets to do things like put clothes in the dirty clothes, throw away items we tell her to, wipe up spills she makes,etc. She loves to help clean. Teach them young and make it habit. Something we do to make life a bit easier is giving our son lots of choices through his day.... He makes choices about everything from what clothes to wear, what to eat for breakfast, whether to hop or skip to the car.....and the list goes on and on. He is empowered and more excited about everything because he is making his own decisions. It is teaching him life lessons about making decisions and dealing with the consequences of those decisions. I've seen many other comments of things that we also do with our son, so Go Moms! Wonderful tips, Shannon! My tip for making bento speedier (and life easier) is to make bento stash. Bento stash are items that freeze well and can be popped into a bento box when time is tight in the morning. Bento stash are things like small meat patties or meatballs, premade crepes, baked mini muffins, and my favorite: frozen edamame. Make these ahead of time and then use them to quickly put together a bento with fresh fruit and veggies. Shannon i'm with you on the not hiding fruits and veggies in 'tastier' food. I completely agree it has the opposite effect in the long run! Teach them to LIKE those foods. Good one! 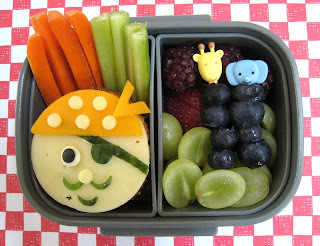 I also LOVE this pirate bento of yours. Always been my fave! Muffin TIn Meals have changed my perspective on feeding my kids. I am more keeming aware of the foods they eat and how much. I love the TOday I ate a rainbow chart. We have just started, but already my kids are getting excited about those "rainbow" foods. To expand the girls palates and get them to try new foods they always have to take a "no thank you" bite. No matter what the food is in front of them they will take a bite and if they do not like it they say "no thank you" and do not have to finish it. More likely than not they end up loving the new food. It sure saves us the fighting and whining at the dinner table. Thanks for an awesome giveaway! - if I can pack part of her lunch, I will. I always try to at least figure out what lunch is going to be. - if I'm really productive, I'll get my lunch and clothes figured out too. I mention rewards for behaving well and doing things right. And follow through such as a trip to the park, library, mall, treats like ice cream and yogurt at a shop...etc. I am 71 so no children at home, but with a great grand baby on the way i will check out Club Mum. Mommy time outs are my best life and sanity saving tip. Of course I make sure they are going to be safe, but sometimes when I feel like I am going to chew through paneling, I will say I have to 'go potty' and I take a magazine, turn on the loud suction fan, close the toilet lid, kick back and read for as long as I can get away with. It has done wonders for my sanity and I am sure the kids appreciate a calm mom. The one thing that has really made a difference for me is planning the whole week's menu on a 5 x 8 card. I keep them in a binder in the kitchen so I can flip back to other weeks for ideas. I write in pencil in case I need to make changes, but at least this way five o'clock never sneaks up on me! We eat out much less than we used to. Having a clean kitchen before I go to bed. When my kids were little, they really love pasta anything and I would steam veggies and add them in or had them as a side dish with butter. They always ate them so I think I was just lucky that way. I definitely agree with getting things ready ahead of time. I get up an hour earlier than the kids to get their breakfasts ready and pack their school lunches. All those toys in the bath. I am the cook/baker at a Children's Center where I feed 80 children breakfast, lunch, and a snack 5 days a week. I am introducing bean based soups, instead of heavy meat based. I add potatoe pearls to thicken the split pea soup and it has been successful. I've also turned to cream of wheat, oatmeal, and maypo for b-fast instead of cold cereal. Thanks for your input, it gave me more ideas! I recently started giving my 3.5-year-old daughter monkey platters. It's a great way to sneak in something new, while still giving her some of her favorites. She's nuts about monkeys, so they always go over well! the bento lunch has helped me tremendously with my picky toddler...but now, I feed veggies and fruits to my 14 month old first and then my 3 year old wants to eat it also. I don't hide food. I tell him what it is, but with his little brother eating it too, he has wanted to try a lot more foods! If you puree "yucky" foods, they don't always notice them! I love all the ideas in this post! My kids love to help cook too. I like to have a variety of fresh ingredients on hand at all times, so we have lots of different things to choose from! I love the ideas from your readers. For us, having healthy substitutions is key. If they are craving salty crunchy chips, we eat popcorn, if they want something sweet, we eat fruit. My kids do not appear to be deprived in any way! I don't have any school aged children anymore, but when my daughter was younger I found organization and routine was the key to limiting stress. I always planned my meals a week in advance and cooked at least one thing we could "make-over" for another meal--like one night pot roast and the next roast beef sandwiches. We also choose our clothes the night before and ironed if necessary. My best parenting "tip" is that I focus on the behavior I want to see rather than the behavior I don't want to see. For example, if my 4-year-old is being really loud when I'm trying to get the 1-year-old to bed, I will say "Please use your quiet voice," rather than "Please stop being so loud!" I find it actually works pretty well. With respect to food strategies that make life easier with kids, I find, as others have noted, that planning is key. I write down a list of the dinners I'm going to cook for the week (my weeknight meals have to be no more than 30-40 minutes to prepare) and shop for the ingredients of those recipes. Then when I get home from work, I just look at the list, decide what sounds good and make it. After dinner I pre-pack leftovers for lunches. I also keep a small stash of homemade "I just can't face cooking tonight" meals in the freezer. Okay, so that was more than one thing. Thanks for letting me share! Such wonderful tips! I definitely hope to implement this when I one day have a child! After having three girls who ate anything and everything, my fourth child, a boy, absolutely refuses to eat anything green. I started buying huge bags of spinach to whir in the food processor. I put the processed spinach in ice cube trays and keep the cubes in a ziploc in the freezer. I make all varieties of fruit smoothies, and he doesn't see me pop in a spinach cube or two. He has no idea how much "green" he has eaten! I add a small can or 2 of low sodium V8 juice to my pasta sauce and turkey chili recipes along with chopped veggies. Usually if the kids help me make dinner, they are more likely to eat it. They know exactly what's in it and want to try what they have made. The dishes will always be there but your child will not always want a hug or have a picture they are willing to share! The best parenting advice ever is to listen to everyones advice but only DO what works for you & your family. What feels right for someone won't be right for someone else. Make ahead freezer cooking has made meal times so much easier! Even on busy sports or lesson nights, we can have a meal quickly on the table. Labeling everything I send to school with my son! He constantly loses gloves, hats, sweatshirts, his water bottle. At least I know everything has his name on it and it has a better chance of coming home eventually. It definitely helps things run more smoothly. Weekly menu plan and get things ready the night before make my life run much smoother. I don't turn on the tv when kids are awake - it keeps all of us from getting distracted. I also schedule time for doing nothing but playing with my kids. It's time not to worry about the dishes/laundry/cleaning etc. It's the most important thing I do every day and my kids agree! Having pegs assigned and colored for coats, hats, gloves & bookbags. AND using them of course ~~ saves alot of searching for this and that every morning. I have tended to my nephews enough to know that some will do something when the others want to do something else. I usually have a back up plan regarding eating out at fast food places. I also keep string cheese and yogurt on hand because these are things that they like. When the boys were littler, I put all of the clothes out the night before. It changed our life! After buying a large quantity of meat (i.e., chicken breasts), I would dice them and store them in Ziplock bags to place in the freezer. When I cook for that day, I would take a bag out to defrost and stir-fry instead of wasting time to prep the meat. Pre-cook meals on the weekend - makes my week run smoother with leftovers on some nights when things are really busy. I cook! My family really likes my food. So, I cook stuff that I know they love. Surrounding the dinner table are some of our favorite times. We talk, eat and learn how to love each other more. Always prepare everything the night before so in the morning you aren't running around crazy! Tip from an old lady. No snacks, no eating between meals, meals on a schedule eat or don't eat what is served. I have a chart for the kids with their list of chores/events/schoolwork they need done. They are responsible for checking it each day. We have a reward/star chart that we keep for each of our kids. Each of our children have chores, that is age related. In addition, for doing their homework (without problems), we also give them stars. The kids are then able to "cash" in their stars for rewards, like a movie, small toy, money, etc. Having a basket by the door for the kids to deposit their book bags. It keeps everything contained. They also keep their hats and mittens in it so everything is ready to go when they need to get out the door. I have a pantry list and menu that I keep rotated so I always know what we need at the grocery store and my husband knows what to cook if I am to busy trying to get the kids to finish with their meltdowns. I also have a rough routine schedule so that everything flows pretty smoothly throughout the day. have a picky 33 year old (the hubby) as well as a picky 10 year old. I often hide the veggies in foods I know they will eat...Like substituting spaghetti squash for part of the noodles in pasta, or using bean (or other veggie) purees in sauces. Out of sight, out of mind, and they are getting their veggies!! I know...I'm sneaky! We are also a cloth diapering family, and I like to pre-stuff my pocket diapers so they are ready to use rather than having to stuff a dipe while holding a squirmy baby! I found that disciplining the children and giving them responsibility made life run smooth around the house. One thing that helps us is to make everything into a song, or a game. It's not brilliant, but it makes things go faster and smoother! Before going to bed everyone night, I make a list of what I have to do the next day. I have found that my head doesn't spin all night worrying that I will forget something. Our organization bins have been a lifesaver. At the end of the day shoes, backpacks and homework go in there and as a result, we have a lot less missing items. Homework is always done on Fridays, so we have the whole lovely weekend for fun! Have them help put the meal together - they'll be more inclined to eat it if they made it. I keep lists to stay organized and always have post it notes so I don't forget anything. Lists! Lists! Lists! A little bit of psychology. Getting things like lunches prepped way in advance helps. Letting the grandkids particiipate like setting the table helps. I have post it notes everywhere to remind me of lists. Life runs smoother when I cook big meals on the weekend, and then we have quick fix leftovers of stuff that I know my daughter likes during the hectic week. With a family of five what helps be is everyone has their own container in the laundry room. Before everyone goes to bed, they have to check and take his/her clean clothes up with him/her. just not letting things pile up, like laundry doing it every day rather than having an overwhelming pile. I agree about "cute" food. I made my kids "Mickey" eggs - yolks were his eyes, toast halves were ears and a cherry tomato or olive was the nose. Silly, but they loved it. I've learned to plan meals ahead. That may sound simple, but if I sit down and write out a grocery list and a meal plan for a few days at a time, it lessens my burden of trying to figure out what to cook when I get home from work, what I'm taking to work for lunch, etc. It saves me sanity, time, and money! My magic bullet blender has been a lifesaver. It has made smoothies a staple in our household. We have them for breakfast, snacks, and even dinner before. It is so easy and nutritious. How else can you manage to get multiple food groups in one serving of delciousness? And the best part about it is that my three kids love them and love helping me make them. My granddaughter loves to help me prepare dinner. She makes a salad and sets the table. She is not a picky eater at all, and we have an enjoyable time at the table. I get my kids to eat by using my imagination. I tell my daughter that chicen is dragon meat. This really works. Healthy snacks and homework go hand-in-hand in my home. Fruits and veggies after school. My life runs so much more smoothly when I lay out both mine and my kids' outfits the night before, as well as make sure the diaper bag is packed and ready to go. Shoes and coats are set out by the door. It makes it so much easier to get out the door on time in the mornings. The best idea I ever had was grounding my two children together. The fought each other viciously to the point one child could not enter the same room with another. I finally had it so I grounded them together. For one month they could not do anything, and I mean anything without doing it together..that meant eating meals, or snack, including what games they played, they could only have a friend over if..If the other child agreed. By the end of the month, they were actually talking and laughing and the war was over. My kids are responsible for getting themselves dressed, making their lunches, getting their backpacks together, etc. It takes a lot of pressure off of me, and teaches them responsibility and independence. It's definately not brilliant, or even original, but I have a big calendar that I write every single thing on from bills due to playdates. I always set out all clothes the night before. that way its all ready to go. Letting your child help you with their meal is a big accomplishment for them and encourages them to eat it. Establishing good food habits from a young age also encourages future good eating habits. I cook chicken a lot of various ways. As I cook something I set aside some small portions for "tasting"..my grandkids taste each new item and either adds it to their favorites or not. I freeze individual portions of the various favorites so I always have something on hand when the grandkids come to visit. We were just talking about this the other night. My mother always made chili with carrots...I can't eat chili if it doesn't have carrots in it now and that's the way I make it for my family. It was my mother's way of sneaking more veggies into our diet and it worked. I think organizing everything the night before school helps our day run much smoother. Before bed my daughter and I find her shoes, lay out her clothes and pack her lunch together so we're not rushed in the morning. I go through our house several times a year & get rid of the things we just don't use. Trust me, life runs a lot smoother when you are not surrounded by useless stuff. I do a clean sweep of my closet about twice a year. This way I keep the clothing I love, donate the clothing I no longer want, and I am able to see what pieces I still need. I know this may seem like a small thing, but trust me, it really helps my sanity! Lists, lists, and more lists, keep my life running smooth. The older I get the more senile I get and I find that I forget to even do the basic things I've done for.ev.er! Here's a way your kids will drink their greens. And love it. I hide spinach, parsley and even kale in frozen smoothies. How? With frozen cherries and blueberries. The fruit is excellent nutrition and covers up the taste of the greens. Put a couple of ice cubes in the bottom of a blender to make sure the motor stays cool. You don't need a $400 blender, I don't have one. Wash baby spinach, a handful or two, put that in the blender. You can add parsley and a few kale leaves later (strip out the hard stringy center, it's bitter). Add orange juice to cover. Whirl until the greens are liquified. Add a package of frozen cherries, a bit at a time. Add some blueberries until the taste of the greens is gone. You may have to add some more o.j. Blend until it vortexes. My son loves this. Even my greens-allergic husband loved it and now drinks green juices with me (no fruit needed). Try it, you'll love it too. Have a family meal at dinnertime and have it be enjoyable...that way your children will think that eating togehter is good and will look forward to it every night. I get them to eat veggies by offering some ranch dip with it! And with fruit, like apples, I offer peanut butter! I make everything a race or say "How fast can you..?" Works like a charm and she gets a kick out of doing things fast. One thing I do is try not to stress to much. I find that the things that really annoy me usually aren't that important anyway. For food I keep very little junk food in the house, so sooner or later the kids are forced to eat the healthy stuff. I run the dishwasher every night and empty it first thing in the morning. That way dirty dishes go right in and don't stack up. I give myself a chore to do while I'm talking on the phone to a friend. Doing a load of dishes or laundry, or dusting the living room goes by really fast when I'm chatting with someone. I help with cleaning up the toys I have a contest with my 2 girls on who can pick up the most toys (and put them away PROPERLY) in 10 minutes! It's amazing how fast the room gets cleaned up! We do prep work for the next day by laying out clothes. This saves a lot of time in the mornings because we don't have to "agree" on what to wear. It may not be "brilliant" but I like to cook veggie purees and then freeze them in muffin pans to incorporate into the adult food, and ice cube trays to be reheated in baby size portions. I love the bento idea! So clever! Bentos are a great idea! I used to tell my son that certain foods were for big kids or grown ups. That helped to get him to at least try new foods. But kids' taste buds are different from adults. We have to respect that and try to please those buds. You know how magazines always say that you need to treat exercise as simply another (non-negotiable) part of your day? I've done the same thing with chores...I don't have an option but to take care of the little things like prepping lunch, doing laundry, and unpacking the gym bag....they just get done and I don't relax until I'm cleaned up and ready for the next day. Has made my life much smoother now that it's not an internal battle to get these things taken care of. We try to have our kids try a new food every week so give them some variety and it doesn't shock them too much, but keeps them from being too picky. I always try to go to bed with my dishes done. It makes it much easier to face the morning rush if my kitchen is organized! My tip is that pureeing isn't just for babies. You can puree veggies into a sauce with some broth, milk or cheese and serve it over healthy whole-grain pasta then sit and enjoy watching an unsuspecting veggie hater slurp it up. I like to cook in quanity and freeze, so there can be times when a good meal is handy and no prep is necessary. I still like to cook in quanity and freeze for days that are rushed or intentionally leisurely. My best idea for getting things to run more smoothly is to turn mundane tasks like cleaning up or brushing teeth into a fun game - I'll have the kids race to see who can pick up all of their toys first, or who can get their teeth the cleanest, which makes these activities no longer seem like a chore (and they get done a lot faster, too!). Thanks! I have always allowed them to assist me, they're more apt to want to eat what they helped to create. We use aprons,chef's hats and colorful tools, I try to make it fun in oppose to being a tug of war. I always have all our meals preplanned. That way we have everything onhand and it's ready and available when we need it! Having lists make my life run as smoothly as possible. I can not function without prioritizing and checking things off a list when they are accomplished. Since my kids were little (and my three are teens now), I taught them that they wer expected to help. From keeping their room clean to putting away laundry, they had chores and responsibilities. I work full time now but until my youngest was 10, I was a stay at home mom. I was always amazed how many never had their kids do a thing and then get angry when they get older and won't help. I do a little everyday so you don't get to behind that way you have more time together. On cooking I hated veggies but learned if you add some chesse to them easier to eat! I also add some butter to my green beans or peas! Great giveaway thank you! We always make time to laugh at our house. Even on the toughest days--maybe especially on the toughest days!--sometimes you need to sit down with the kids and just be silly and giggle. It's amazing how much better the rest of the day goes after that. When my kids were younger, I worried a lot about getting them to eat a good breakfast. Finally figured out that letting them choose what they wanted was the way to go. That meant anything from last night's leftovers to cold pizza (yuch!) to green eggs and ham or pink pancakes.